This is a story about a young Bullmastiff, beautiful beach, a steep slope, a new flying friend. One day in late May, our puppy protagonist was out and about getting to know his neighborhood and for the first time ventured further than ever before with his owner. Full to the brim of excitement to explore a beach he did not yet know, he passed his own speed limit and fell down a steep slow at the river's edge. With dusk quickly approaching, there was a very real chance that our little friend would have to spend the night outside, cold and alone. 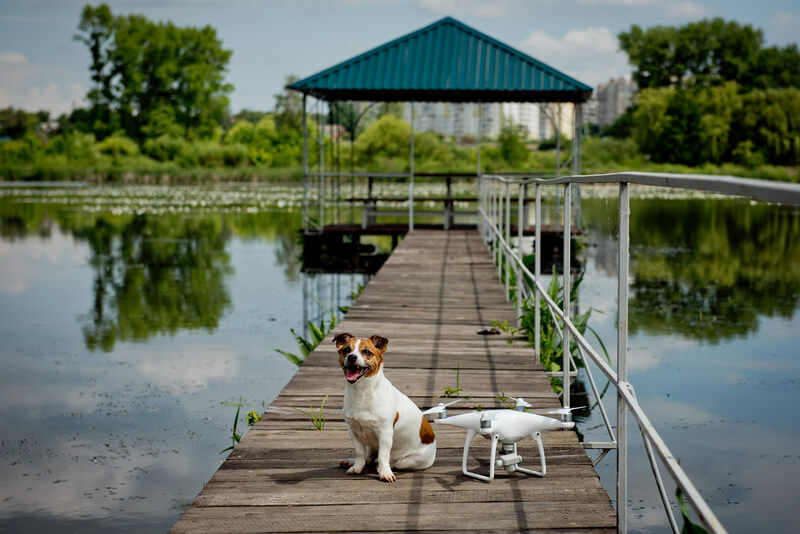 Luckily, Gold Hill, Oregon, U.S., the small town where our canine friend lives, has a forward-looking fire department who had already begun adapting drones to their work. Short on time, Mike Calhoun, Jackson County Fire Department's Battalion Chief, made the decision to try out the department's new DJI Phantom. Using the aircraft, they were able to quickly scout the site and locate the puppy, and send the rescue team down to bring him back up to mom and dad. Just in time for dinner, too! Curious to hear more about this adorable rescue, we called up Mike Calhoun, for a quick chat. Thank you Mike for taking the time to talk to us. We're really interested in hearing how you use the Phantom in your work. To start off, what made you acquire the Phantom? Our department acquired the Phantom to use as a tool to assist in technical rescues in swift water and high angle environments. The plan is to utilize it for scouting purposes and to provide additional intel regarding the incidents we are responding to. Other factors that aided our decision to purchase the Phantom were the relatively low cost and the ruggedness of the drone. Can you explain in detail how the puppy fell down the bank? The puppy fell off the cliff edge due to being very close to the edge and the nature of the material that comprised the bank. The cliff edge is made of rock and sand that has been compressed by time. The edge is quite brittle and undercut, being exposed to the elements constantly. Because of this, the puppy’s weight (approximately 50 pounds) caused the edge to give way and he fell about 40 feet to the hard rock bank at river’s edge, at the bottom. How did the Phantom improve the rescue operation? The Phantom aided in the rescue by providing an excellent vantage point to observe the movement of the puppy, and our rescuer once he reached the bottom of the cliff. Once the rescuer was lowered to the river’s edge, he had to disconnect from the rope system to make contact with the puppy. The Phantom was able to track him and monitor his progress much better than the rescue observer stationed at the top of the cliff edge. Do you think you'll keep integrating drones in your work? Any other uses you can see for them? It is our intent to continue to look for creative ways to integrate the Phantom into our rescues and various other types of emergency responses. We plan to use it for initial operations during wild fire incidents, until safety and law dictates we land it upon arrival of firefighting aircraft. We also plan to fly the Phantom during building fire incidents to gain an aerial 360 degree view of the incident. This view should aid incident commanders in understanding the magnitude of these types of fire more clearly. Thank you, Mike, for taking the time to answer our questions! We look forward to seeing you expand your drone operations in the future.